Disclaimer: This article is open for discussion. I have bought this reference book for Secondary 1 Express Mathematics, fourth reprint 2012, 2nd Edition, and found some questionable examples. (b) When the sea level is exactly halfway between high tide and low tide, it is 3 m from either tide. The sea level is (4 – 3) m = 1 m below the clam at this time. 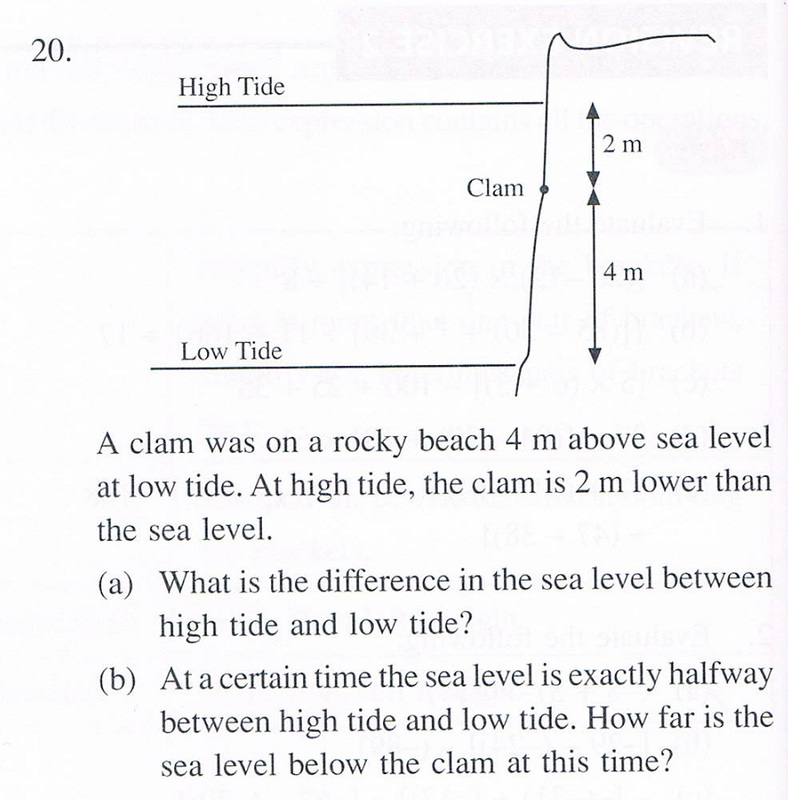 Below is the extract from Page 123, the answer in the book for question 20. Answer (b) is different from what I have done. From the calculation of the sea level, it is 3 m, which is the same as my answer. Thus, from the picture above, even without calculation, we can deduce that the sea level is 1 m below the clam when the sea level is exactly halfway between high tide and low tide. With this example and another example on factors and multiples, I hope parents and students will be careful when referring to any reference books available in the market. If you have any doubt, always find a third opinion. Most importantly, have confidence in yourself, do not feel discouraged if your answers are different. Knowledge is gained through questioning. I am not sure if they have rectified the error, just want to alert parents and students if you have bought the same book with the same version as mine. I welcome comments and feedback. Thank you. By Wendy in Mathematics on 19/03/2013 .